Be agile. Continuously develop and localize your application real-time. New strings in the code flow into mojito, get translated, then flow back into the code. All automated! Mojito supports Android, iOS, PO, Java, Windows Resource files and XLIFF files using Okapi Framework. Translate with confidence. mojito rejects translations with potential errors. Search specific strings across multiple repositories and languages. Recycle and leverage existing translations. 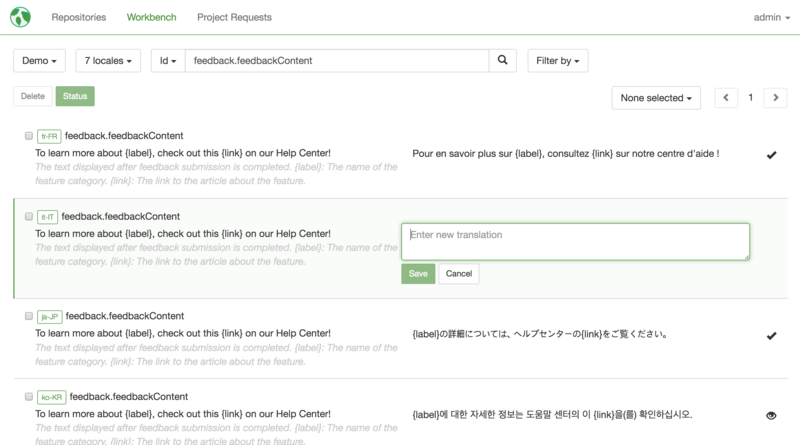 Simple UI to manage translation packages for offline translations and reviews. Powerful command line to manage TM, repositories and users. Straight-forward integration with CI pipleline such as Jenkins etc. Create and Restore TM backup.